Here’s a secret your digital shop won’t tell you: Most iPhone and Droid apps are used only a handful of times before being quickly forgotten. Pinch Media recently studied 30 million app downloads and found that after 24 hours, only 20% of users tapped the app again, and after three months only 1% of users continued to engage. What’s a poor marketer who wants fame on a handset to do? Rather than fight it, we’ve suggested using apps as a new content inventory — a toss-away campaign element that can be followed with future apps, just as TV spots or print ads are rotated out with new creative. 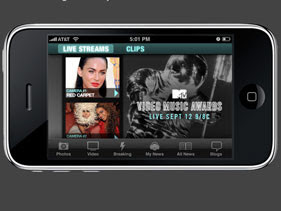 MTV is doing just this with an updated app tied to tonight’s 2010 MTV Video Music Awards. Grab the new MTV app and you’ll get an “all-new VMA-exclusive section” with red-carpet and backstage clips. MTV scores two points, one for making its app a microcampaign with a short shelf life, and two for tapping into the concurrent media usage habit of consumers who check other devices while watching TV. If MTV convinces you to play with your smart phone during commercial breaks, you may not change the dial — helping ratings and those silly ads across all the device channels break through your cortex. This is a really great strategy Ben. Lots of light bulbs going off since Mobile Marketing is one of my focuses. I know all the BS surrounding Apps and since getting my Droid2 in August, I have realized 1] there are 60,000 Apps too many for Droid and 2] good luck getting your App seen in the store. In fact I think the way to promote an App is outside the App Stores. So let me take this thought you presented here a bit further on the technology side. Maybe create a time bomb App like the Get Smart Notes that self destructed. If we go this route of Apps with a specific life span for a specific purpose maybe at the end of the life span have them automatically uninstall as a way to create Goodwill with consumers who will trust your brand not to clutter their phone knowing it will be gone eventually. This way they might be even more likely to download your next App promotion?